"Hölderlin" redirects here. For the German band, see Hoelderlin. Hölderlin was born in Lauffen am Neckar in the Duchy of Württemberg. His father, the manager of a church estate, died when the boy was two years old. He was brought up by his mother, who in 1774 married the Mayor of Nürtingen and moved there. He had a full sister, born after their father's death, and a half-brother. His stepfather died when he was nine. He went to school in Denkendorf and Maulbronn, then, beginning in October 1788, he studied theology at the Tübinger Stift, where his fellow-students included Georg Wilhelm Friedrich Hegel, Friedrich Wilhelm Joseph Schelling (who had been a fellow-pupil at his first school) and Isaac von Sinclair. In 1797 there was written a seminal manuscript now known as the Älteste Systemprogramm des Deutschen Idealismus ("Oldest System-programme of German Idealism"). Although the document is in G. W. F. Hegel's handwriting, it is thought is have been written by either Hegel, F. W. J. Schelling, Friedrich Hölderlin, or an unknown fourth person. Only in 1913 did Norbert von Hellingrath, a member of the circle around poet Stefan George, bring out the first two volumes of what eventually became a six-volume edition of Hölderlin's poems, prose and letters (the 'Berlin Edition', Berliner Ausgabe). 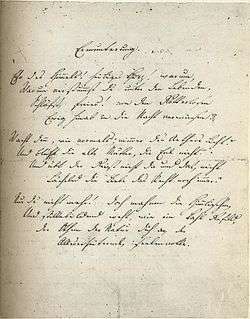 For the first time, Hölderlin's hymnic drafts and fragments were published and it became possible to gain some overview of his work in the years between 1800 and 1807, which had been only sparsely covered in earlier editions. The Berlin edition and von Hellingrath's impassioned advocacy of Hölderlin's work shifted the emphasis of appraisal from his earlier elegies to the enigmatic and grandiose later hymns. The Berlin edition was to some extent superseded by the Stuttgart Edition (Grosse Stuttgarter Ausgabe) edited by Friedrich Beissner and Adolf Beck, which began publication in 1943 and eventually saw completion in 1986. This undertaking was much more rigorous in textual criticism than the Berlin edition and solved many issues of interpretation raised by Hölderlin's unfinished and undated texts (sometimes several versions of the same poem with major differences). Meanwhile, a third complete edition, the Frankfurt Critical Edition (Frankfurter Historisch-kritische Ausgabe), began publication in 1975 under the editorship of Dietrich Sattler; it is still in progress. There are other editions; it should be noted that no two of them show all the major poems in congruent textual status. Strophes and readings are sometimes arranged in different ways from one edition to the next. 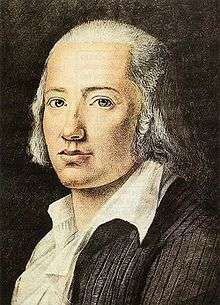 Hölderlin was a poet-thinker who wrote, fragmentarily, on poetic theory and philosophical matters. His theoretical works, such as the essays "Das Werden im Vergehen" ("Becoming in Dissolution") and "Urteil und Sein" ("Judgement and Being") are insightful and important if somewhat tortuous and difficult to parse. They raise many of the key problems also addressed by his Tübingen roommates Hegel and Schelling. And, though his poetry was never "theory-driven", the interpretation and exegesis of some of his more difficult poems has given rise to profound philosophical speculation by thinkers as divergent as Martin Heidegger, Theodor Adorno, Jacques Derrida, Michel Foucault and Alain Badiou. One of the earliest settings of Hölderlin's poetry is Schicksalslied by Brahms, based on Hyperions Schicksalslied. Other composers of Hölderlin settings include Peter Cornelius, Hans Pfitzner, Richard Strauss (Drei Hymnen), Max Reger (An die Hoffnung), Alphons Diepenbrock (Die Nacht), Walter Braunfels ("Der Tod fürs Vaterland"), Richard Wetz (Hyperion), Josef Matthias Hauer, Hermann Reutter (an opera, a choral work, 18 songs), Stefan Wolpe, Paul Hindemith, Benjamin Britten (Sechs Hölderlin-Fragmente), Hans Werner Henze, Bruno Maderna (Hyperion, Stele an Diotima), Luigi Nono (Prometeo), Heinz Holliger (the Scardanelli-Zyklus), Hans Zender (Hölderlin lesen I-IV), György Kurtág (who planned an opera on Hölderlin), György Ligeti (Three Fantasies after Friedrich Hölderlin), Hanns Eisler (Hollywood Liederbuch), Viktor Ullmann (who wrote settings in Terezin concentration camp), Wolfgang von Schweinitz, Walter Zimmermann (Hyperion, an epistolary opera) and Wolfgang Rihm. Carl Orff used Hölderlin's German translations of Sophocles in his operas Antigone and Oedipus der Tyrann. Wilhelm Killmayer based in 1986 two song cycles Hölderlin-Lieder for tenor and orchestra on Hölderlin's latest poems. Kaija Saariaho's Tag des Jahrs for mixed choir and electronics (2001) is based on four of these poems, Graham Waterhouse composed in 2003 Sechs späteste Lieder nach Hölderlin for (singing and speaking) voice and cello on six latest poems. Several works by Georg Friedrich Haas take their titles or text from Hölderlin's writing, including Hyperion, Nacht, and the solo ensemble "... Einklang freier Wesen ..." as well as its constituent solo pieces each named “... aus freier Lust ... verbunden ...”. Many songs of Swedish alternative rock band ALPHA 60 also contain lyrical references to Hölderlin's poetry. Finnish melodic death metal band Insomnium has set Hölderlin's verses to music in several of their songs. Many of Hölderlin's work have been recorded as audio books. Notable is a reading by Martin Heidegger for the dedication of the record label ECM. It has released two readings of Hölderlin poets: one in 1984 by Swiss actor Bruno Ganz simply called Hölderlin (ECM 1285), and one in 2012 by voice actor/vocalist Christian Reiner called Turmgedichte (ECM 2285). Furthermore, ECM released an album called Scardanelli with spoken texts and music from the 2000 movie of the same name by German director Harald Bergmann. Another example is the 1991 recording of Heinz Holliger's Scardanelli-Zyklus (ECM 1472) conducted by the composer. ↑ "Because of his small philosophical output, it is important to indicate in what way Hölderlin’s ideas have influenced his contemporaries and later thinkers. 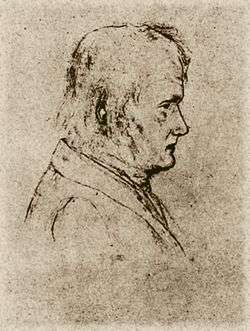 It was Hölderlin whose ideas showed Hegel that he could not continue to work on the applications of philosophy to politics without first addressing certain theoretical issues. In 1801, this led Hegel to move to Jena where he was to write the Phenomenology of Spirit.... Schelling’s early work amounts to a development of Hölderlin’s concept of Being in terms of a notion of a prior identity of thought and object in his Philosophy of Identity." Christian J. Onof, "Johann Christian Friedrich Hölderlin", Internet Encyclopedia of Philosophy. Accessed 15 Jan 2011. ↑ "Hegel is completely dependent on Hölderlin – on his early efforts to grasp speculatively the course of human life and the unity of its conflicts, on the vividness with which Hölderlin's friends made his insight fully convincing, and also certainly on the integrity with which Hölderlin sought to use that insight to preserve his own inwardly torn life." Dieter Henrich, The Course of Remembrance and Other Essays on Hölderlin, Ed. Eckart Förster (Stanford: Stanford University, 1997) p. 139. ↑ "Indeed, the Pietistic Horizon extended for generations up to and including the time when Hegel, together with his friends Hölderlin and Schelling, spent quiet hours strolling along the banks of the Neckar receiving the theological education they would eventually challenge and transform through the grand tradition now known as German Idealism." Alan Olson, Hegel and the Spirit. (Cambridge: Cambridge University Press, 1992), p. 39. ↑ Shelton, Roy C. (1973). The Young Hölderlin. Pieterlen and Bern: Peter Lang Publishing, Incorporated. p. 107. ISBN 978-3-261-00315-7. ISBN 3-26100315-4. ↑ Hölderlin, Friedrich (2007). "Introduction". Selected Poems and Fragments (With a new preface an introduction 1998). Translated by Michael Hamburger (bilingual ed.). London: Penguin UK. p. 26. ISBN 978-0-141-96218-4. ISBN 0-14196218-6. ↑ Constantine (1990), p. 299. ↑ Constantine (1990), p. 302. 1 2 Constantine (1990), p. 300. Wikimedia Commons has media related to Friedrich Hölderlin.